By far our most popular course that we run is our beginner archery courses. Our beginner’s archery course aims to give you the basic understanding of archery. We will take you through the basics of archery and all the safety elements and add a few extra bits on the way. 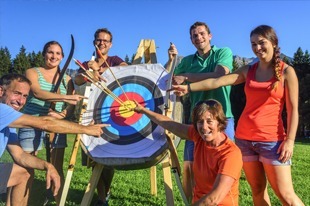 By the time you have finished the course you will be able to shoot an Olympic Style Recurve Bow and understand the main safety factors on an archery range. You will be able to build and take down the recurve bows, we will introduce you to Longbows, Compound bows and help you understand the scoring systems. We will have had a chance to look at your shooting technique and form and will have made some changes to help you shoot better. At the end of the course, you will receive your beginner’s course certificate. You need to do a beginner’s course before you can join a club. Our courses consist of either 3-hour or 2-hour sessions, taken over consecutive weeks if possible, weather permitting. Courses are generally run at our shooting ground at Greenlands Farm Village or Crag Bank Village Hall in winter. Pre-booking this course is essential, so if you are interested in taking a course, get in touch as soon as possible.